Everything responds to touch in some way too. Poking a bird makes it squawk, but tap a boat, and it responds by launching itself from the dock. In all, there are over 200 interactions to discover. As a result, you never know exactly what the response will be, which makes exploring fun, regardless of whether you find the hidden objects. 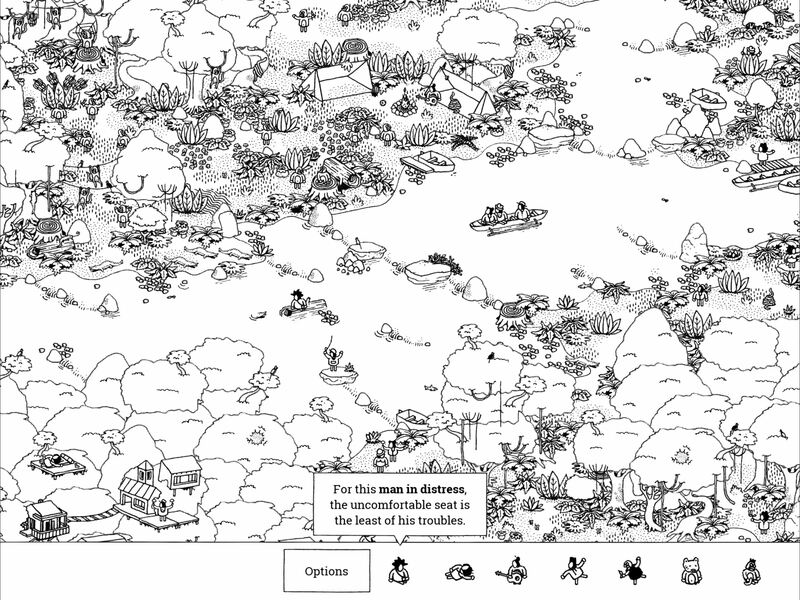 Hidden Folks starts in a ‘Forest’ environment, which has five areas to explore. In addition to Forest, there are ‘Dry Lands,’ ‘City,’ and ‘Factory’ worlds, each with areas to unlock. The items you need to find in each stage are displayed in a horizontally scrolling menu along the bottom of the screen. Tapping each item provides a clue about where to look for it. There is also an Options button to access settings and the ability to record gameplay. This game shines on the 12.9 inch iPad Pro’s large screen. But even on Apple’s largest iOS device, Hidden Folks’ areas don’t fit within the bounds of the screen, which should give you an idea of their scope. I was surprised and impressed that Hidden Folks works almost as well on the much smaller screen of an iPhone. You cannot see nearly as much as on an iPad, but panning and zooming work surprisingly well and the addition of haptic feedback on the iPhone adds to the game’s interactivity. Hidden Folks can also be played on the Apple TV, though I have not had the chance to try it there yet. 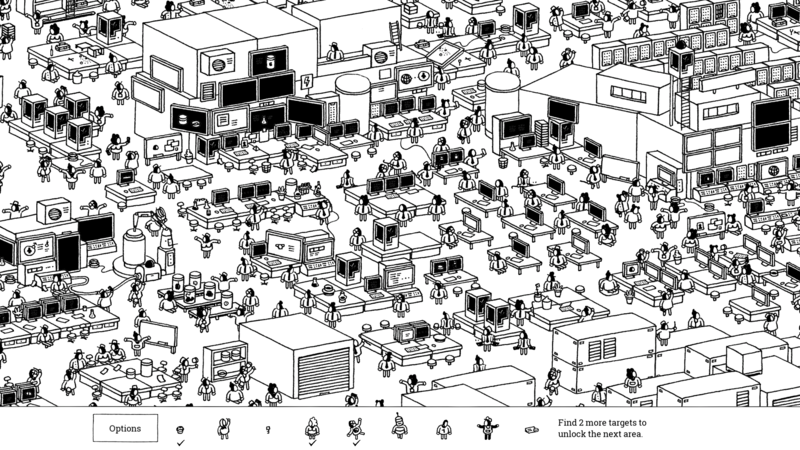 Hidden Folks is an absorbing, relaxing experience as much as it is a game. There are no points, timers, or other stress-inducing mechanics. Instead, the game revolves solely around exploration. The synthesis of playful art, sound effects, and animation is sure to have many people exploring Hidden Folks for hours at a time. When you finally put the game down, though, try Hidden Folks’ stickers for Messages, which include over 100 delightful illustrations from the game. Hidden Folks is available on the App Store for iOS devices and the Apple TV. A Mac version is also available on Steam.